A: We are located on the West Side of Oahu in Kapolei near Campbell Industrial Park area. West Bound from H1, take Exit 1 (Campbell Industrial Park Ramp). Stay on Kalaeloa Blvd, passing through the first intersections of lights. You will see Costco on your left. After you go through the light, make the immediate left at the next light (Lauwiliwili Street). You will then pass the fire station, and a church on your left. We are located in the Next Cluster of buildings. Use the second entrance or when you see Sherman Williams paint on the left hand side. We are in the second building. Unit 105F. A: Yes we have a nice show room. We have the LARGEST SELECTION Pet Urns here in Hawaii. We also have a Facebook Business page. Like Us to get updates! A: We do not have store hours. We are by appointment only. You can call or text me at (808) 927-5347 to make an appointment. I will respond within minutes to confirm. All Visitors Welcome by Appointment Only. If you like to stop by, You will need to make an appointment by calling (808) 927-5347. DO NOT JUST SHOW UP. Due to the sensitive nature, it is advisable to make an appointment. Best time and days to visit are Monday thru Thursday between Noon to 9PM. ALL SALES ARE FINAL. However, sometimes mistakes happen and purchase is made in error. Simply contact us and will assist you with the process of an exchange. 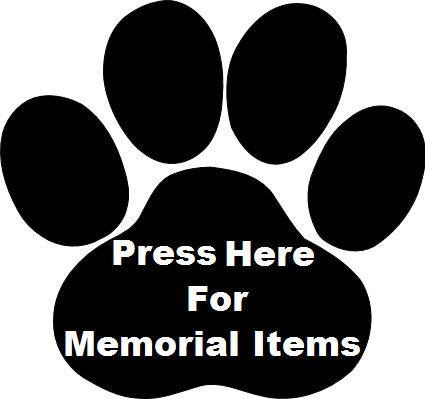 ALL Items purchased from Aloha Pet Urns are final. Sorry, No Returns. ALL SALES ARE FINAL. Some Items can be exchanged but cannot be returned or refunded. Any item that has been personalized or engraved cannot be exchanged or returned. Urns that have been used or filled cannot be exchanged or returned. Items that have been damaged or tampered with by the customer cannot be exchanged or returned. WE HAVE LARGEST SELECTION OF PET URNS IN HAWAII! Please use the Green Menu Buttons above to navigate through my web site or simply click on the PAW links below to the areas of interest! 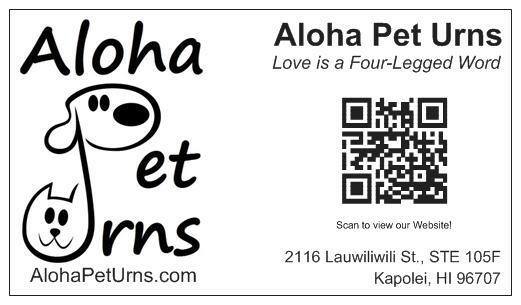 Aloha Pet Urns is a Registered Trade Name of The Aloha Island Boy and operates under J&J Innovations, LLC., Prices are subject to change without notice. Information here in on the website are deemed reliable but not guaranteed. Due to the nature of the business, ALL SALES ARE FINAL. A Down Payment is required when placing your order and is different from a deposit. A down payment is not refundable and is consider fully earned once production begins. All Photos Copyright © 2009-2014 and property of TheAlohaBoy.com. All Rights Reserved and Protected by International Copyright Laws. No photographs on TheAlohaBoy.com may be used in any way unless written permission.